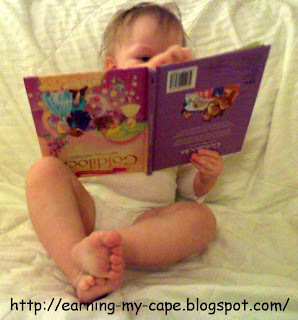 Earning-My-Cape: Reading: Some Rules Are Just Meant To Be Broken! Reading: Some Rules Are Just Meant To Be Broken! Have you ever taught a kid to read? Soon to be five... and then six. We go through the same thing every time! First we learn the sounds the letters make. Then we learn the other, not-so-common sound some of the letters make. Then we work on vowel teams and consonant blends and such.... you get the idea. When a vowel team goes a walkin', the first one does the talkin'. When there is a silent "e" at the end of the word, it makes the other vowel long. If the letter "c" is followed by an "e" or an "i", then it makes the /s/ sound. Just like the letter "g"... only it makes the /j/ sound. Me: OK, let's read this. I like to visit the ducks. The ducks like to eat. I like to feed the ducks. I will give the ducks some bread. Me: Wait, remember the rule? What does the silent e do? Kid: Oh yeah... like. I like to visit the ducks. Me: You did! Good Job! Kid: The ducks like to eeaaat (sounds like short e and short a)... What does that mean? Kid: (excited) The first one does the talkin'! Oh yeah! The ducks like to eat. Kid: (interrupting) But the g has an i after it. That makes it say /j/. That's the rule, Mom. Me: Yeah, but it isn't the rule this time... this is a tricky word. Me: I don't know why. Some words are just like that. Kid: Ok... I will give (read with the /g/ sound, but still with the long i... and a little bit of attitude). Me: Um.... no... it's a short i sound. Kid: But it has a silent e! Me: I know, but remember, it's a tricky word. Me: Um... this word has a short vowel, too. Kid: Oh come on!!!! There's a silent e!!! Kid: Ugh! OK. I will jive... um I mean, give the ducks some breed. Kid: But the vowel team is walkin'! The e is supposed to be long! Kid: (sighs) I will give the ducks some bread. Kid: Why are there even rules if the words don't follow them? Me: That's just how they are. Me: I don't know why. Me: I agree! I think we're both ready for a break! WHY??? I mean, seriously!!! Why so many rules and so many broken rules? I'm sure it probably goes back to how our language was formed from other languages and such, but come on! Couldn't someone have made it a little easier? Despite it all, somehow, kids keep practicing and they persevere. After all of the frustration and all of the questions and stumbles, something in their brain just "clicks" and, seemingly overnight, they are a full blown reader. That is a glorious moment. As a homeschooling Mom, I have no prouder moment than when my kids learn to read. That very moment makes it all worth it. How do you explain the broken reading rules to your kids? What are your favorite homeschooling (or non-homeschooling, I know parents of school kids do a lot of teaching, too) moments? What are your more frustrating moments? Please leave a comment & maybe we can all share some ideas, laughs, and thoughts. Thanks so much for stopping by The Winthrop Chronicles! What a cute blog you have!